Experts from Nature Iraq, the Royal Botanic Garden Edinburgh, and BirdLife International conducted biodiversity surveys throughout the year on Piramagroon. These surveys have revealed new information about the area, including new records of dragonflies for Iraq and a dramatic increase in the number of known plant species. To date the number of plant species known from the Mountain is estimated to be 650, which is more than double the 295 species previously known. 26 of these plants are endemic or near endemic to Iraq. Drafting an IUCN Red List assessment for birds and endemic and near endemic plants. Georeferencing of historic herbarium records will enable the incorporation of more baseline botanical data into Nature Iraq’s Iraq wide Key Biodiversity Areas assessment. Developing a series of resources which can be used for protected area management on Piramagroon Mountain. Producing interactive identification guides to the biological diversity of Piramagroon, including photographic guides which can be downloaded to mobile phones. Photographic guides have been recognized as a particularly accessible and user friendly way to disseminate information in the Middle East. 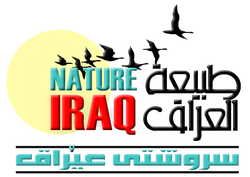 This will be the first time in Iraq or regionally that a mobile application has been created for the specific purpose of biodiversity identification and conservation.